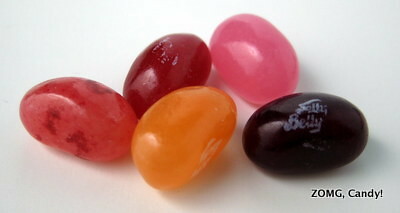 Jelly Belly was promoting their new line of Snapple-flavored jelly beans at Sweets and Snacks. I picked up several free little sample bags while there and later got a larger free bag in the mail from the folks at Jelly Belly. While my bag had all five flavors mixed together, they also come in little bottle-shaped single-flavor containers. Fruit Punch was dark purple. It started with notes of plum, then became slightly tart before mellowing out. I was pleasantly surprised at how it had a distinctively non-Hawaiian Punch flavor. Kiwi Strawberry was a mottled pink. It started with the spot-on flavor of strawberry, then took on grassier notes of kiwi. This is one of my go-to Snapple flavors, so I know it well. 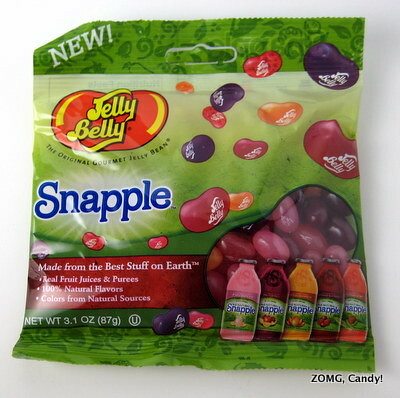 The jelly bean version was more nuanced than the drink! Mango Madness was orange. It started with a seedy-mango flavor that then took on some slight tartness. It then becomes sugary sweet and finished with a plasticky note that I wasn’t a fan of. Cranberry Raspberry was a dark maroon/red. It tasted like lightly sweetened cranberry juice and had a slight raspberry seediness to the finish. That seedy factor ain’t my thing, but it was a nice representation of what you’d expect cranberry raspberry to be. Finally, pink lemonade was a translucent pink with no mottles. It had a nice mild lemon flavor to start with a bit of tartness and just a hint of zest around the edge before finishing with a cane sugar sweetness. 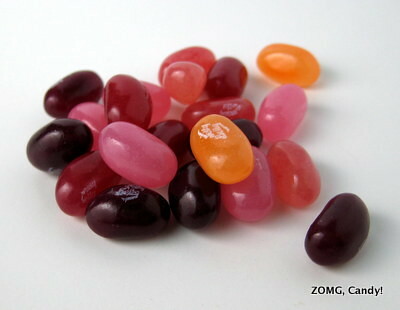 These were a nice assortment of flavors with the high quality that you’d expect from Jelly Belly. Nothing too exotic or unexpected, but a solid spin-off/brand partnership. An O.
Cybele reviewed these back in April, if you want a second opinion.